It’s time for One Nation Labour to set out its electoral stall for real now. Scotland has force the point, chased hotly by doubts over Ed Miliband’s ability to lead our party or being a suitable Prime Minister. Scotland – and in particular the huge turnout of the Independence referendum – has given Westminster-based politics the kick up the arse voters knew it desperately needed. Now there’s a leadership contest there and it proves to be shaping what Scottish Labour ought to look like and represent. Is it just a branch of Parliamentary Labour or something distinct in the Labour movement in Scotland? Clarion readers will probably agree that the latter might also prove the kick up the arse our Parliamentary Labour Party needs to become meaningful for the electorate. Given a meaningful choice on Independence, the voters demonstrated they are hungry to engage in proper change. Indeed, I doubt whether a remote branch in Scotland was what John Robertson and Jim Sillars had in mind when they first set-up the breakaway the Scottish Labour Party back in 1976. Instead they sought to be a voice distinct from Westminster. I believe there’s appetite for more of that kind of independent thinking within Labour, and furthermore we can have that without having to abandon our Party. In fact, I’d wage it might be a way to electoral success. I certainly witnessed this desire for local distinction among some of our number in the 2015 District Council Forest of Dean CLP Manifesto Drafting Group which I had the honour to lead. But this doesn’t have to be a binary thing: you can follow Labour Party principles and rules and still have a distinctive voice in local politics. In fact, I rather think it’s what the electorate expect of us. It’s in looking for new choices that some have been persuaded by the shadowy repulsiveness of UKIP. We need to demonstrate that our Party and our local candidate, and indeed local and country councillors offer the electorate meaningful choice, not just more of the same. The defence for the leadership of Milliband is mostly characterised by the principle of having to stick with the choice made a couple of years ago at the Leadership Election. But by that logic we would allow Ed Miliband to do virtually anything to destroy our movement before we’d kicked him into touch. Although I’m not saying he has or will destroy Labour, I’m just questioning the principled stand of permissiveness just for the sake of a principled stand. To me that’s not much of a defence. The argument also goes that ‘we’re only 6 months away from an election!’ Agreed, not a desirable time to switch leadership. But again, says who? Based on what? If there’s evidence that the leader is not polling well when actually he should be at his strongest (into the final term of opposition) then that is an argument for decisive change not capitulation. If total unity isn’t the current, it won’t appear just because we’re running out of time. What you’ll get instead is internal maneuvering for the post-defeat Labour Party. Put another way, sticking with an unelectable leader just because we’re running out of time is not a good reason to stick with an unelectable leader. The final argument appears to be that there’s no willing or able candidate to replace Miliband. Is the shadow cabinet really so moribund to not one capable shadow minister willing to stand up for our movement? I don’t think it is. So that too is a false defence. If the NHS is the one binding element of our campaign which universally moves British people of voting age, then clearly the robust, capable and comparatively natural leader is the person leading that part of campaign: Andy Burnham. I’d support that move in a second, and I think the British people would too. Voters would see a Labour Party willing to listen to the public (in their dislike of Miliband) and make meaningful change. 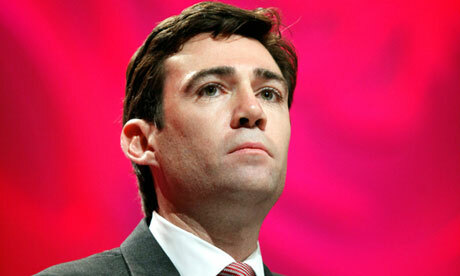 If Burnham is seen as the saviour of the NHS in austerity, then he might just save our movement and the legacy of Labour. It should also guarantee us success at the next election. True, a Burnham Labour won’t take us back to the manifesto of Michael Foot in 1983, but it wouldn’t be New Labour either. Those who agree with my general argument might also take heart that when asked during the local Parliamentary candidate hustings as which member of the current shadow cabinet did he/she most admire or ally themselves with, our chosen candidate – Steve Parry-Hearn – cited Andy Burnham. NOTE: The views expressed in this column are the personal views of C. Spiby and not the Forest of Dean Labour Party or Steve Parry-Hearn. Tony Benn, Barroness Royall and concerned members of society the worldover, but especially in the Forest of Dean & Wye Valley.